Innovation and job creation are important goals in society and government at present. Capitalizing on all of our nation’s intellectual potential is crucial for global competitiveness and for remaining an attractive destination for future innovators and entrepreneurs to obtain an education. Increasing engagement in this space requires identifying barriers to participation. Women make up 50 percent of the workforce, more than 25 percent of STEM employees, but hold less than 10 percent of the patents. At the Association for Women in Science (AWIS), we identify the problems that cause women to leave the STEM pipeline and propose solutions to increase retention. In this study, we sought to identify reasons why women patent at a lower rate than would be expected and develop realistic solutions. In our research to identify the reasons women are not more successfully engaged in this space, we spoke to technology transfer managers and officers, patent attorneys, policymakers, and entrepreneurs. 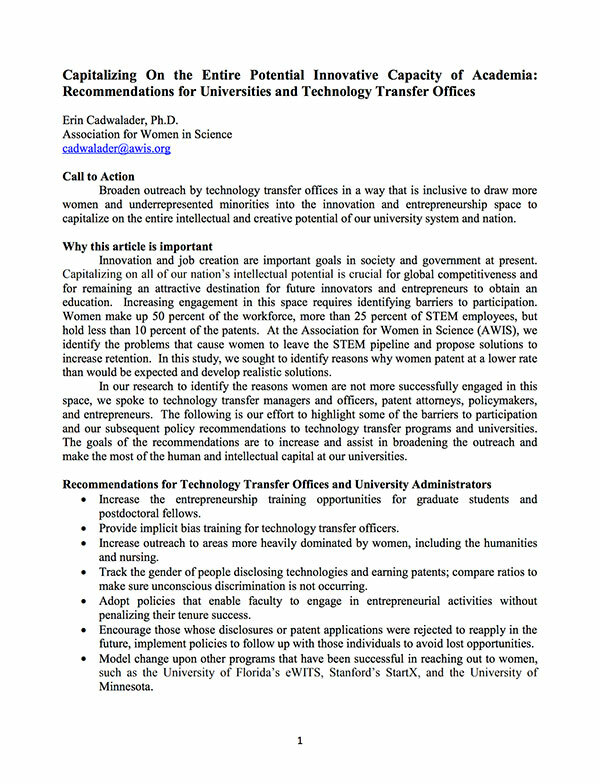 The following is our effort to highlight some of the barriers to participation and our subsequent policy recommendations to technology transfer programs and universities. The goals of the recommendations are to increase and assist in broadening the outreach and make the most of the human and intellectual capital at our universities.